Commissioner for Information and Strategy, Mr Kehinde Bamigbetan; Commissioner for Energy and Mineral Resources, Mr Wale Oluwo; Director General, Ambode Mandate Support Group (AMSG) & Special Adviser to the Governor on Community and Communication, Hon. Akeem Suleimon; former Chairman, Egbe-Idimu LCDA, Hon. Adebayo Bello and former Chairman, Ikorodu North LCDA, Hon. 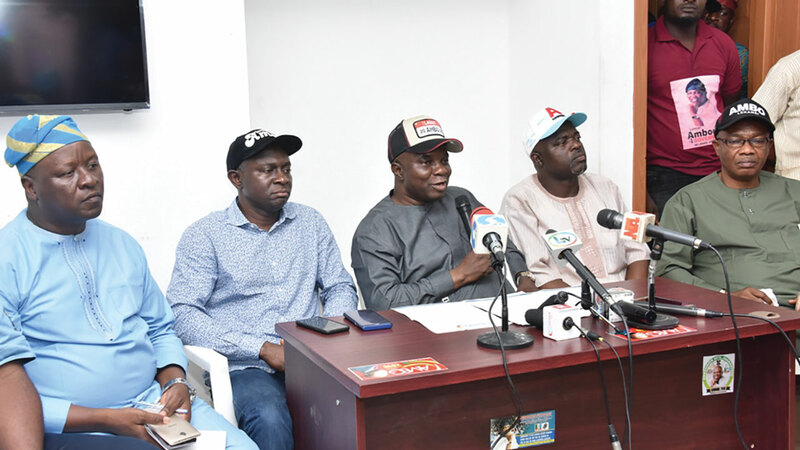 Jimoh Tijani during a briefing by the Ambode Mandate Support Group (AMSG) on the mobilisation for Governor Ambode ahead of the party primaries, at the Group’s office in Ikeja. 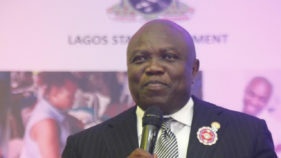 The Ambode Mandate Support Group (AMSG), yesterday, faulted reports purportedly quoting the Governors Advisory Council (GAC) of the All Progressive Congress (APC) in Lagos, asking Governor Akinwunmi Ambode to withdraw his second term bid, saying it is inimical to democracy, which the party preaches. Reacting to the purported endorsement of Mr. Babajide Sanwo-Olu by the GAC and shift of the party primary earlier scheduled for today, Director General of AMSG, Hon. Hakeem Sulaimon said the sudden turn of events does not augur well for democracy and unity of the party. “I don’t think the GAC would have done such a thing as represented by Senator Anthony Adefuye, because a few days ago, the GAC came out to say that they have resolved that His Excellency the Governor will not be granted the same privilege granted fellow governors in other states and that every aspirant should go for the primaries. 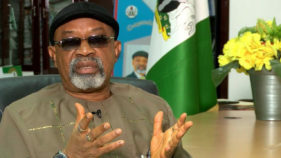 “The party said we are in a democracy and all the three aspirants should run, now they have shifted ground and they are asking the Governor to step down for another aspirant, why are they saying so if they are preaching about democracy? Meanwhile, the Governor’s second term bid got a major boost yesterday, as major stakeholders in the party threw their weight behind him, pledging their full support.